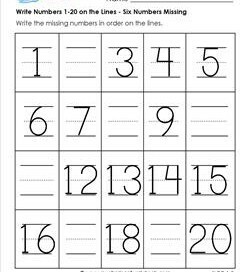 These write numbers 1-20 worksheets are a step above the tracing numbers 1-20 worksheets. They have primary writing lines for kids to practice writing their numbers neatly and clearly, assuming the kids will know the numbers that need to be written on the lines. Remind the kids to write the numbers from top to bottom and left to right, trying not to go above or below the lines. These worksheets vary in how many numbers need to be written. 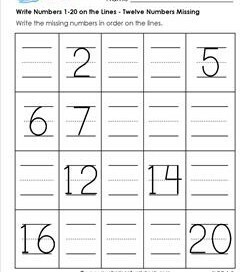 Counting and writing numbers meet together in this simple write numbers 1-20 page with only 6 numbers to write. For beginners or slower kids. 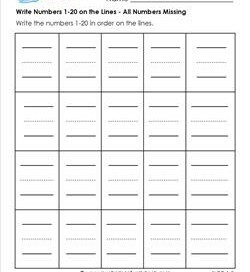 Write only the even numbers in this write numbers 1-20 worksheet. Writing every other number instead of all the numbers is the perfect amount for some kids! 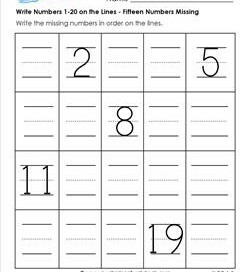 Kids can now try writing the other half of the numbers – the odd ones – in this writing numbers 1-20 worksheet. Be sure to have them write nicely on the lines! In this write numbers 1- 20 worksheet 12 numbers are missing. Use to ease kids into writing all 20 numbers or for slower kids so they’ll be sure to finish. 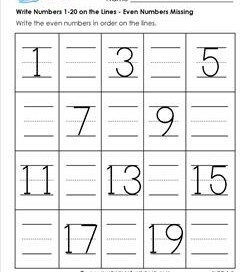 In this write numbers 1-20 worksheet, kids write 15 of the numbers on the primary writing lines. Five numbers are already provided to keep the kids on track! Kids write all the numbers 1-20 on the primary writing lines in this worksheet. 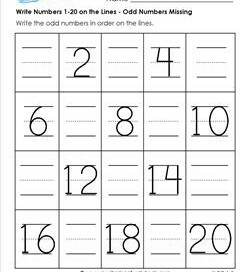 Use to practice neat number writing or for assessment purposes.